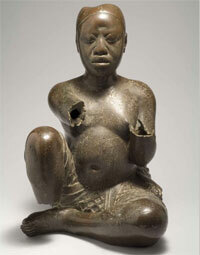 Copper sculpture from Medieval West Africa (Tada, Nigeria ca. 1300 AD). By 800 AD, the people of Djenne-Djeno had built a tall wall of mud-bricks around their town. The wall would protect them from their enemies. (But as we will see, in the end this didn’t work!) The people of Djenne-Djeno were rich. Many of them wore gold jewelry. They were doing more and more trading, now that they had donkeys to help them carry loads. The people of Igbo-Ukwu lived at the other end of the Niger river, in the forests down near the Atlantic Ocean in modern Nigeria. These people were smelting copper and tin into bronze by 900 AD. They weren’t using the same methods as in North Africa, so they seem to have invented bronze for themselves. They made sculptures with it using a lost-wax method (but again, not the same lost-wax method as in North Africa at this time). By about 1000 AD, they were also making and selling glass beads. Around the same time in nearby Ife, Yoruba people were also building cities. Their Oni (kings) were thought to be descended from the creator god Oduduwa, whose worship centered on the small city of Ife. They, too, produced bronze statues. Soon after that, though, Islamic traders and soldiers began to cross the Sahara desert from North Africa and attack Djenne-Djeno. Possibly they were driven by increasing droughts associated with the Medieval Warming Period. By 1000 AD, Djenne-Djeno was less powerful than before. In the 1100s AD, a new kingdom north of Djenne-Djeno arose, the Kingdom of Mali. Mali controlled a lot of land. By 1400 AD, nobody lived at Djenne-Djeno anymore. They had all moved to a new, Islamic town called Djenne. The Yoruba people, further away from the Sahara and the Islamic invaders, seem to have lasted longer, and to have still been doing pretty well when the first Portuguese explorers arrived from Europe near the end of the 1400s AD. Cite this page: Carr, K.E. Medieval West Africa – Bronze, glass, and drought. Quatr.us Study Guides, October 2, 2017. Web. April 23, 2019.